Rendered predominantly in stark shades of black and white, Godwin Bradbeer’s isolated figures emerge out of the existential void. This recent body of work sees Bradbeer continue a life-long inquiry into often angst ridden questions that surround the human condition, experienced both collectively and individually and located on a metaphysical plane. His vessel for expression is the body, which for Bradbeer is an enduring motif redolent with limitless potential for creative interrogation. 176 × 154 cm. Image courtesy the artist and James Makin Gallery, Melbourne. From time immemorial artists have attempted to give shape to the notion of existence, and somehow rationalise this ‘mortal coil’. Such efforts are witnessed in classical Greek sculpture – where divinities fashioned in stone were created to explain and order the universe. When expressing ideas beyond comprehension that could only belong to realm of the gods, an ideal beauty was invented which took human form in its physical characteristics. Like the sculptors of antiquity Bradbeer also uses the figure to penetrate slippery ideas of humanity and transcendence, and while in many ways and by his own admission this is well ploughed territory, the artist has established a unique and original vision. His figures are reminiscent of ancient Egyptian, Asian and Classical sculpture in their stylised postures and static unmoving weight, yet defy the specificities of race and culture and thus achieve a universal significance. 141 × 141 cm. Image courtesy the artist and James Makin Gallery, Melbourne. The influence of sculpture on Bradbeer’s practice is also detected in the dialectic between presence and absence. Just as the material form of a sculpture shapes the void that surrounds it, so too do Bradbeer’s faces and figures delineate the abstract spaces in which they reside. Removed from recognisable context and often containing minor geometric elements or diffused areas of glowing colour, Bradbeer places his figures in a kind of non-space that lacks depth, yet is not shallow, and contains no markers alluding to time and place. Perhaps it is a visual manifestation of an unconscious state, or the mental space travelled to between dreaming and waking. If consciousness exists in the figure, then unconsciousness inhabits in the void that surrounds it. They are equally reliant on each other – one can’t exist without the other, and so Bradbeer uses abstract fields to give emphasis to the endless spark of genesis, of being that his figures silently manifest. 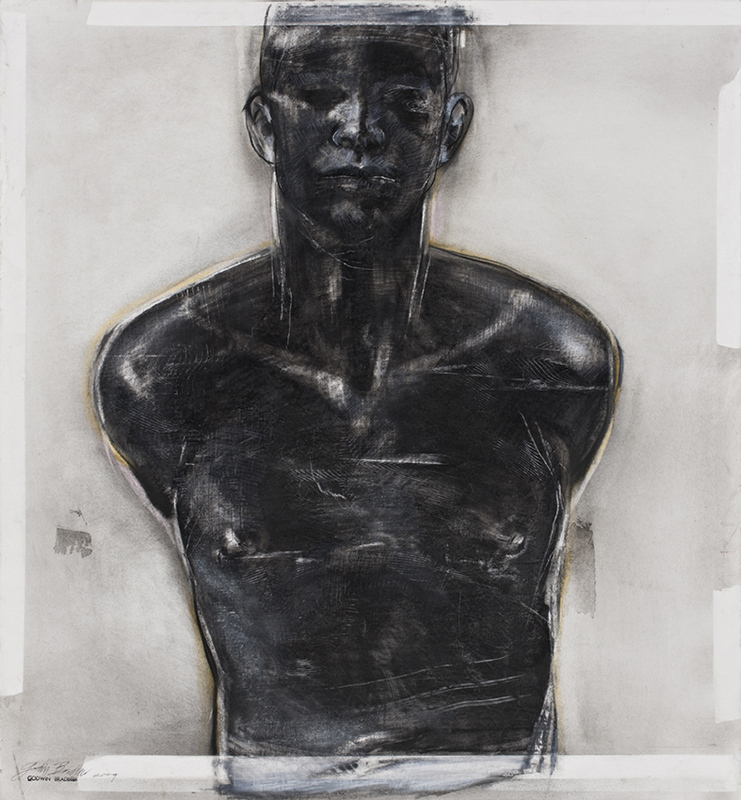 In this body of work Bradbeer eschews the depiction of the figure in its entirety. Cropped, cut and disembodied these human vestiges convey the anxiety of incompleteness. In many works like Man of 1000 Cuts, Self Portrait as a Wasp and Breathing Man Version 2 Bradbeer places the figure in the bottom half of the picture plane, truncated below the chest. Eyes downcast and close to life-size, they are imbued with a resigned melancholy, and like all the works that comprise Gravitas, they move away from a forensic inquiry of human form which exist in the artist’s earlier drawings where the inner skeletal structure is often depicted. Instead the nuanced facial expression and subtle inclination of the head contributes to the understated emotional veracity that pervades the entire exhibition. Like all of Bradbeer’s work Profile in Exile 3 sees the artist treat his subject matter, here a disembodied male head cradled by two floating hands, with complete reverence. Bradbeer cites as influential in this work the rarity and importance bestowed upon a precious object, like an unearthed archaeological fragment. The profile has an ethereal yellow and grey glow which descends into hues of pink. This haloed glow infuses the piece with an almost spiritual dimension, perhaps containing a metaphor for sacrifice and deliverance. 105 x 80 cm. Image courtesy the artist and James Makin Gallery, Melbourne. Ecce Homo carries a more visceral intensity. The Latin “Ecce Homo” translates to “Behold the Man” the biblical words uttered by Pontius Pilate upon the presentation of Christ at his trial. This phrase has been used in Christian art for centuries to pinpoint this pivotal moment, where Christ is usually depicted standing contrapposto, with his hands bound before him in an attitude of pained acceptance. Conversely in Bradbeer’s Ecce Homo the audience is confronted by the full frontal view of a man whose arms appear to be bound behind his back, evidenced in the pronounced tension present in his chest and shoulders. While the piece has no literal religious intent, the suggestion of restriction and surrender is immediately recognisable and powerfully felt. In contrast to this charged pathos expressed outwardly through the body, Bradbeer’s Imago series contain a more internalised, meditative focus. 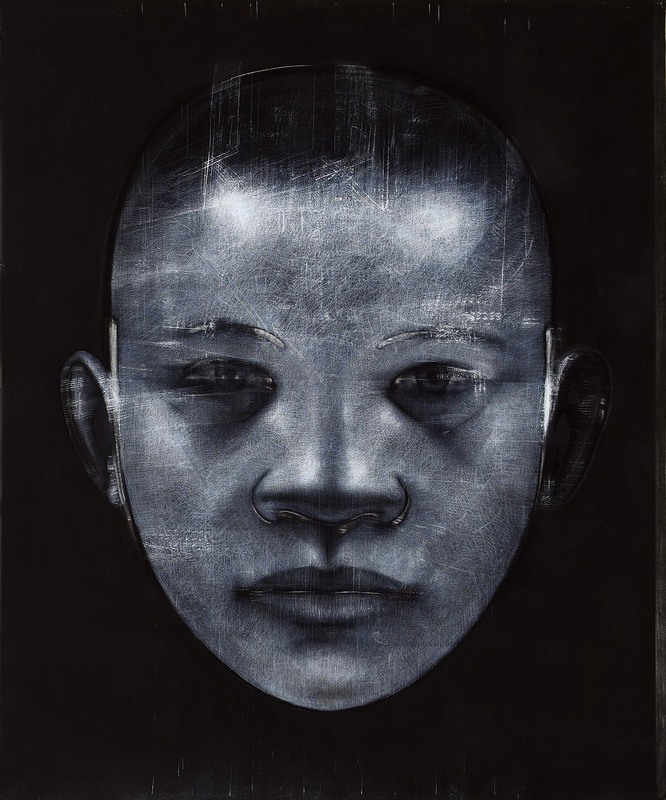 All the works from this series feature a frontal view of a head that hovers in an often black, vacuum-like space. The unwavering gaze that looks through the viewer is reminiscent of Eastern deities in its sublime and idealised countenance. Yet Bradbeer avoids direct cultural reference and its subsequent symbolic implications, maintaining instead universality in form and metaphor. Drawn on a impressively large scale, the epic planes, peaks and valleys that comprise the Imago faces allows for these parts of a whole to be examined in isolation, where their essentially abstracted nature can be fully comprehended. 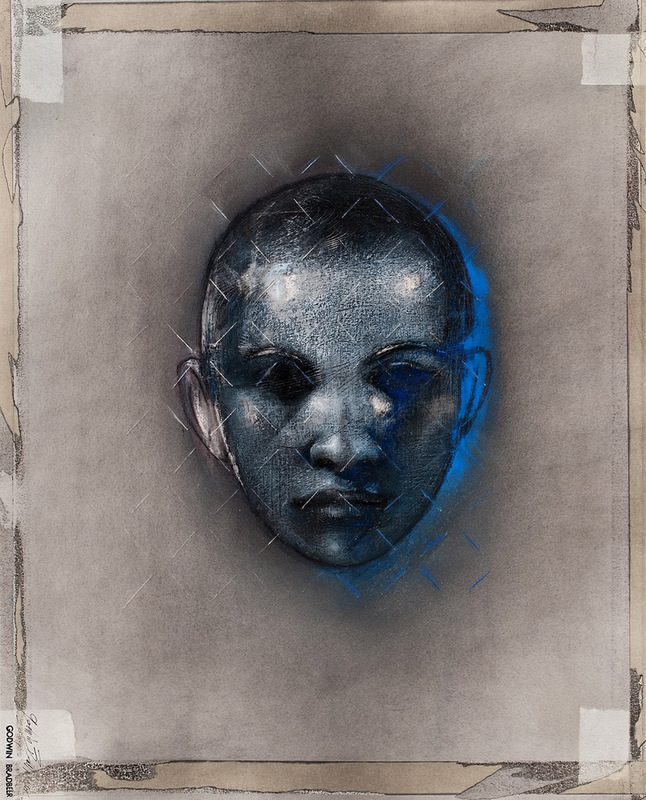 Bradbeer renders his figures and Imago faces through tonal modelling edged by linear marks that reveal additions and subtractions, so that their periphery seems to shiver and shift. He enjoys upsetting his burnished solid surfaces through scratching, or slicing the paper. Broad strokes and staccato markings are made by the teeth of a saw as it’s dragged across the surface of most works. While in Man of 1000 Cuts, and the smaller Cameo –Matrix Blue, the drawing has been sliced in a regular pattern with almost surgical precision. The integrity of the surface is undermined, and the idea of the image representing an illusionary space is disrupted as the viewer is constantly brought back to the physicality of the paper. Like ritualistic scarification these cuts communicate controlled, purposeful violence. The artist injures his surfaces at the point where he can do no more to them. 70 x 50 cm. Image courtesy the artist and James Makin Gallery, Melbourne. Drawn from memory with skills honed by regular life-drawing practice, Bradbeer’s subjects are the composite of innumerable people seen and rendered. Both absorbing and discarding inherited cultures to create these timeless visions of humanity, Bradbeer’s drawings do not attempt to contain the awed mystery that lies at the heart of being. Rather they recognise it, and in doing so speak to every one of us who dares to do the same. 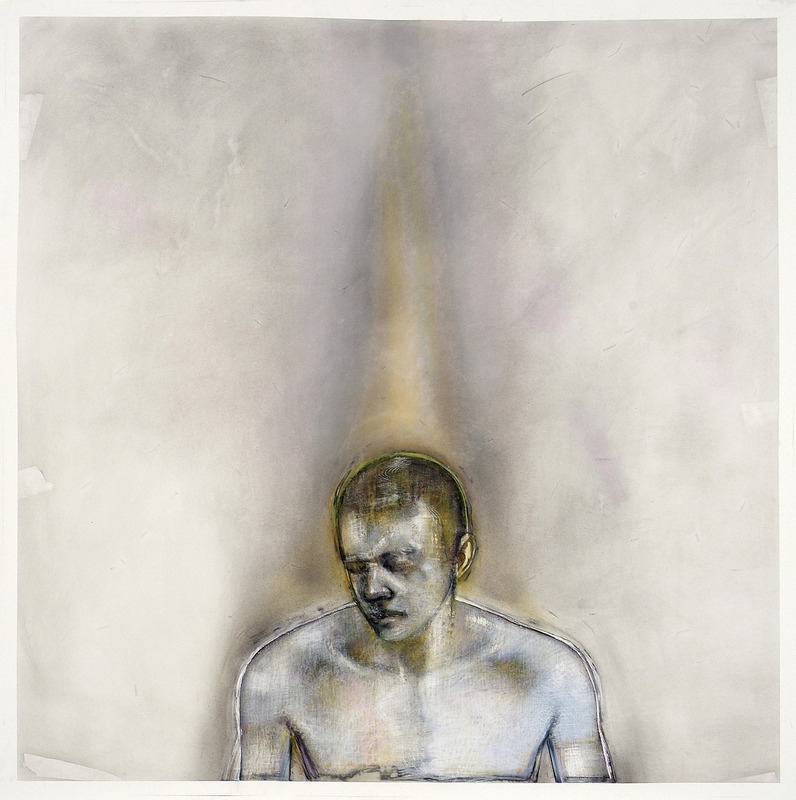 Tags: art, Art History, Artists, contemporary art, Drawing, Godwin Bradbeer, James Makin Gallery, Metaphysics, pastel. Bookmark the permalink. These are beautiful and powerful.There is an exact inexactness which really appeals to me. It may seem relatively trivial, but, as an artist, I am fascinated by his treatment of the edges of his compositions. Yes Bradbeer’s edges are always an interesting part of the work, a frame within a frame and quite self conscious use of the medium…drawing the eye back to the surface qualities.